And here is where one of the regular sceptical lines of comment appears in time for Christmas. Surely that would be a massive slaughter. Why didn’t this bloodbath make the news? How come nobody wrote about it? The fact that we have no record of this nasty episode shows that it’s pure myth, just like most of the other stuff in the Gospels. Right? But this is much too hasty. It is the objection of a person sitting in front of a computer screen in modern New Zealand, Australia, Britain or America, with no understanding of the purported situation about which he is asking. I mentioned this some years ago while reviewing a sceptical documentary by Bryan Bruce. In the first place we do have a record of this event, namely in the New Testament, which is a source that is more likely than most to care about what happened because of why it happened. Not every killing became a matter of public record, only those that had some reason to be recorded, such as these. It is unreasonable to reject out-of-hand every source that is of Christian origin. The Christians are the ones who would have been more likely to keep a record of this event than any other group, and it is only bias that rejects the source just if that source is a New Testament document. It seems difficult to imagine such a massacre was not mentioned by Josephus, a first-century historian who described other events in Herod’s life. One could be a sceptical of Matthew’s account of a massacre of infants. Grisly though it may have been, the killing of perhaps ten children – in a world without mass media or Youtube – would probably not be deemed to be historically important. Sadly, such killings happen in parts of the world now, in small places that are not even on our radar, that we never hear about and will not be read about by generations to come. But lack of reference to the slaughter of the innocents in the work of major historians is to be expected. ASIDE: Others raise the more radical allegation that Bethlehem never existed at all in the first century. What is it with claims like this – Jesus never existed, King David never existed, Bethlehem never existed. Not content with moderate criticism, some people always have to jump in the deep end (generally lacking the ability to swim). Texts in the Bible and the Amarna Letters refer to the town’s existence during the period in question. Although not strictly required (especially given that we’re talking about a small place), it’s nice to know that archaeological evidence for Bethlehem’s ancient existence has now been found. Posted on December 18, 2014 June 13, 2018 by GlennPosted in apologetics, theology and biblical studiesTagged Gospels, historical apologetics, New Testament. Great writing there, Glenn. Thanks for this. Did not King Herod the Great order the execution of all babies two years AND UNDER (which was presumably measured from the time of his order)? Inasmuch as he knew precisely when the wise men saw the star (a sign telling them WHEN Jesus was born) why would he not kill only those born near the time Jesus was born? In other words, why kill babies who had just been born (unless he was doing it out of spite)? I can only guess at how the Roman Emperor would look at Herod’s Infant Execution order “after action report”. But I, for one, do not believe Herod ever sent such a report for he did not commit such an atrocity. If Luke is true, baby Jesus was taken back to Nazareth within weeks after his birth; so when the Roman soldiers of Matthew’s Gospel showed up at the “house” where Jesus was born and was supposedly residing), no one was there. 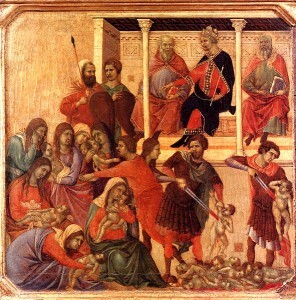 If Herod truly believed there was a Baby King born in Bethlehem would he not likely have had his soldiers covertly follow the wise men there in order to find where the the holy family was located and would have had them kill the young child Jesus, the wise men, Joseph, Mary and the sheep herders if he could locate them. Is an honest person supposed to believe a King like Herod) would assist wise men go worship another king?